Migration to host <xxxxx> failed with error msg.vmk.status.VMK_IS_DISCONNECTED (195887150). Timed out waiting for migration data. A general system error occurred: Migration to host <xxxx> failed with error Connection closed by remote host, possibly due to timeout (0xbad003f). From the ESXi hostd logs. unexpectedly and migration has stopped. The probable clause of the closed connection is a migration failure detected on the remote host. –> Migration to host <xxxxx> failed with error Connection closed by remote host, possibly due to timeout (0xbad003f). reason = “Failed to initialize migration at source. Error 0xbad00a4. VMotion failed to start due to lack of cpu or memory resources. Ran the following command on the ESXi host. Noted the bad checksum aka Receive CRC errors. This count increased after each vMotion attempt. Then run esxtop and hit “n” . 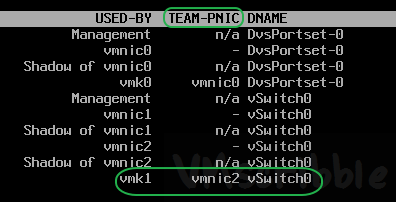 Under the TEAM-PNIC column, vmk1 (my vmotion network) is using the other vmnic number 2. Once the “bad” vmnic3 was administratively marked as down, the vMotion traffic was switched to vmnic2 (a different physical adapter) and all of the vMotions worked! The “Receive CRC errors” count did NOT increase. Ended up having the physical adapter be faulty and replaced.